Toddler/Infant Sibling Interactions - Joyful Toddlers! My daughter is two and my son is almost one month old. 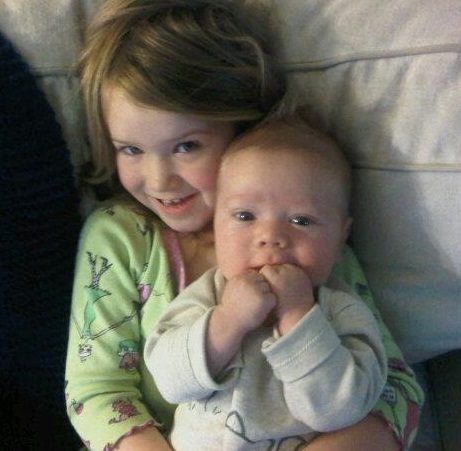 My daughter is madly in love with her baby brother and wants to hold and carry him. I help her hold him while sitting down, but am having a tough time redirecting when she tries to pick him up or take him out of my arms and pulls on him. I find myself saying no while playing tug o war with my infant- not effective parenting 🙁 Really, I’m looking for advice on those situations when the toddler puts herself or others in harm’s way. Another similar example is that when she plays with her friends, she will hug and not let go until the friend cries or falls over. Toddler/Infant Sibling Interactions I’ve noticed that two-year-olds with infant siblings do best when they get lots of help with EVERY physical interaction, until they have strong habits in place. The best way to establish these habits is to have very firm ‘rules’ about how it’s OK to touch the baby: she can hold him sitting down while you help, or she can touch him with one finger. I’m a huge fan of one-finger-touching for 1- and 2-year-olds. It is useful for ANYTHING they might want to grab, that could be hurt or ruined: flowers, computers, your earrings, your baby son. So, first introduce these rules. She already knows about you helping her hold him when she’s sitting down, so introduce the one-finger rule. “You can touch your brother with your one finger. This is how we do it. That’s right! You’re doing it too! You can always touch him with your one finger.” Then, for the next several weeks, EVERY time you see her going to touch him, jump to her side and help her touch him with her one finger. Whenever she tries to touch in another way, lovingly show her how she CAN touch him. (If she is able to kiss him without grabbing, kissing on the head or arm is OK too. If she can’t resist grabbing when she kisses, teach her to blow kisses to him to show her love and affection.) After a few weeks of physically helping her touch with one finger every time, you will start to be able to remind her verbally from a little distance away. Soon she’ll do it by herself, looking right at you. “That’s right! You know how to touch your little brother!” Even once she does that, she may still need help when she’s tired or excited. She may also occasionally try to touch him in another way, looking over at you to see if it’s OK. For now, go ahead and remind her how she CAN touch him—with one finger. Once her habits of touching him really gently are firmly in place, you can start to expand from there. Acknowledge that you’re changing the rules. “Now that you know how to touch him so gently, you can touch him with your whole hand. You can stroke his arm, like this. Yes!” Expand the acceptable ways of touching very slowly, and start helping her notice if he’s liking her touch or not liking her touch. “Look, he’s pulling away. He’s saying, ‘that’s too rough!’” or, “Even though you’re touching him gently, he’s saying ‘Not right now.’” And help her touch him in a way that he likes, or if he’s not liking anything, to pull away and blow him a kiss instead.This technique is very energy-intensive for several weeks or even a few months. But it’s totally worth it, because you’re laying the foundation for positive sibling interactions for the rest of their lives. Siblings who notice what the other one wants (or doesn’t want), and respond respectfully to those cues, have positive relationships with one another. This noticing and responding respectfully is the key to bypassing the bossy/bullying/playing-the-victim/picking-on-each-other-till-they-explode cycle that can mar many sibling relationships. So start laying the groundwork now! Surprisingly well-written and infomrtaive for a free online article. Oh how I wish I had seen this a year ago! Very good idea with the one-finger touching! I am pregnant with my second, and my son who will be 22 months when she comes is sooooo affectionate. He loves giving hugs and kisses to his friends, to his stuffed toys and even pictures in books. He can definitely be a little rough with his hugs at times and I was so happy to come across this advice. I feel like I have a few tools now and it really eases my mind a little more about having such a vulnerable being around my son, who means well but could potentially harm the new baby. So thank you so much. I have found so much of your insight to really align with me and how I want to parent. You are truly amazing at what you do. Bless you!